The Uncovering and Transfer of the Holy Relics of Sainted Vasilii (Basil), Bishop of Ryazan (Comm. 3 July), was done by the Ryazan archbishop Theodorit (1605-1617). 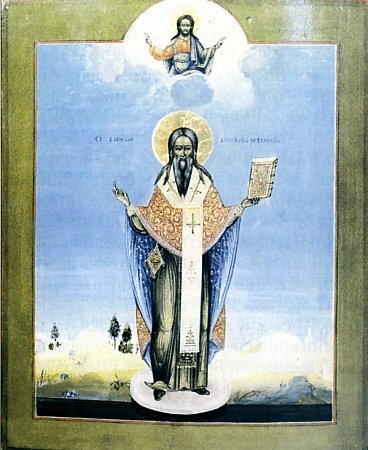 It pleased Divine Providence during the Time of Troubles to glorify Saint Vasilii: on 10 July 1609 occurred the uncovering of his relics and their transfer into the Uspenie-Dormition (afterwards Nativity) church in the Kremlin of Ryazan-Pereslavl', which from the time of the Ryazan bishop Jona II (1522-1547) had been the cathedral church. The relics of Saint Vasilii were placed beneathe a reliquary at the left kleros-choir, alongside the iconostas. A tropar and kondak were then compiled. From that time the name of Sainted Vasilii was "commemorated throughout all the churches of the Ryazan diocese". They recoursed to him as to "their constant intercessor, an helper in sorrow and peril". Under archbishop Moisei (1638-1651), a stone crypt in 1638 was built over the relics of Saint Vasilii, and over it was put the Murom Image of the MostHoly Mother of God – "the Supplication of Vasilii". It is known that during this period moliebens to Saint Vasilii were made in the Ryazan churches. On 10 June 1645 under archbishop Moisei was the first solemn celebration of the transfer of the relics of the saint. Especially fervent in veneration of the Ryazan sainted-hierarch was archbishop Misail (1651-1655). By his command in 1653 was made a superscription upon a large silver water-consecrating cup: "This cup be of Ryazan Pereslav, in the cathedral church of the Uspenie and the holy Passion-Bearers Boris and Gleb, and our father among the saints Vasilii, Bishop of Ryazan, Wonderworker". In 1655 Sainted Vasilii was depicted upon a silver cross together with Saint John the Forerunner and Sainted Jona, Metropolitan of Moscow. In 1712 during the time of the metropolitan Stefan Yavorsky, there was constructed over the place of the original burial of Saint Vasilii, – at the Borisoglebsk church, a chapel in stone, through the zeal of the clerk-copyist Nikita Altukhov. In the years 1722-1723 under emperor Peter I there was conducted a formal investigation about the saint, after which Saint Vasilii was imaged upon an icon together with other Russian saints. The Novgorod metropolitan Dimitrii (Sechenov) during a stayover as bishop of Ryazan (1752-1757) compiled the service to Saint Vasilii: "having first of all in mind the writing of the tropar, kondak and kanon". And indeed through his efforts was made over the relics of Saint Vasilii a new crypt in the likeness of a reliquary with an icon of the saint. In 1782 the reliquary over the relics of Saint Vasilii was elegantly adorned by the archbishop of Ryazan of Zaraisk, Simon (Lagova) (1778-1804). In 1810 under the Ryazan and Zaraisk archbishop Theophylakt (Rusanov), there was promulgated an ukaz-decree of the Holy Synod about the celebrating of Sainted Vasilii on the Sunday of All Saints. On 4 October 1836 a new memorial was unveiled at the spot of the uncovering of the relics of Saint Vasilii, having been erected through the zeal of the churchwarden of the Borisoglebsk church, Simeon Panov. In 1871 archbishop Alexei (Rzhanitsky, 1867-1876) for his first time served the Divine Liturgy at the Borisoglebsk church on the feastday of Saint Vasilii, 3 July. Under archbishop Palladii (Raev, 1876-1882) by ukaz-decree of the Holy Synod in 1881 were declared the days for commemoration of Saint Vasilii to be: 3 July – the day of his blessed repose, and 10 June – the day of the transfer of his holy relics. Even at present Saint Vasilii is especially venerated in the Ryazan lands. In each temple of the Ryazan diocese there is his icon, and in the majority of the churches, moreover – a wall-mural depiction of the saint, sailing along on the water on his mantle with the Murom Icon of the Mother of God in hand. In the cathedral church each Wednesday evening there is made the singing of an akathist to him.